Disability discrimination occurs when a person is treated less favourably, or not given the same opportunities, as others in a similar situation because of their disability. The Disability Discrimination Act 1992 (DDA) makes it unlawful to discriminate against a person, in many areas of public life, including: employment, education, getting or using services, renting or buying a house or unit, and accessing public places, because of their disability. The DDA covers people who have temporary and permanent disabilities; physical, intellectual, sensory, neurological, learning and psychosocial disabilities, diseases or illnesses, physical disfigurement, medical conditions, and work-related injuries. It extends to disabilities that people have had in the past and potential future disabilities, as well as disabilities that people are assumed to have. 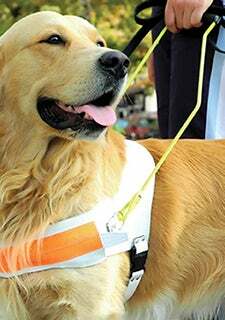 In addition, the DDA protects people with disabilities who may be discriminated against because they are accompanied by an assistant, interpreter or reader; they are accompanied by a trained animal, such as a guide, hearing or assistance dog; or they use equipment or an aid, such as a wheelchair or a hearing aid. The DDA also makes it against the law to discriminate against someone because of their association with a person with a disability. 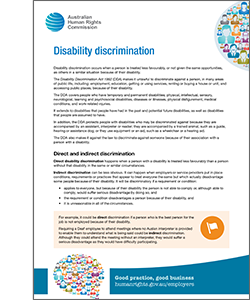 Direct disability discrimination happens when a person with a disability is treated less favourably than a person without that disability in the same or similar circumstances. For example, it could be direct discrimination if a person who is the best person for the job is not employed because of their disability. it is unreasonable in all of the circumstances. For example, requiring a Deaf employee to attend meetings where no Auslan interpreter is provided to enable them to understand what is being said could be indirect discrimination. Although they could attend the meeting without an interpreter, they would suffer a serious disadvantage as they would have difficulty participating. The complainant advised that she has depression. The complainant claimed that the respondent supermarket withdrew an offer of employment after she disclosed her disability at a pre-employment medical assessment. On being advised of the complaint, the respondent company indicated a willingness to try to resolve the matter through conciliation. The complaint was resolved with an agreement that the complainant would be offered employment in one of the respondent’s stores. All types of employers and employment relationships are covered under the DDA, including: Commonwealth Government employees, state government employees and private sector employees; full-time, part-time and casual employees, as well as apprentices, trainees and those on probation. It also extends to contract work and membership of partnerships of three or more people, as well as discrimination by federally registered trade unions and bodies with control over professional, trade or occupational qualifications. In addition, the DDA covers recruitment processes organised through labour hire, recruitment and employment agencies. For example, it may be unlawful for an employment agency not to refer a person with a disability for a position if he or she could do the job. Like other anti-discrimination laws, the DDA says that in some circumstances treating someone differently because of their disability isn’t against the law. This is known as an exception or exemption. For example, the DDA says it may not be against the law to refuse to employ a person with a disability if because of their disability they cannot perform the inherent requirements of a job. However, the DDA also says that employers must consider how the person with a disability could be provided with reasonable adjustments to help them do the job. An adjustment is reasonable if it does not impose ‘unjustifiable hardship’ on the employer. The DDA permits discriminatory acts done under statutory authority; acts which are justified on public health grounds; and reasonable differences in the provision of insurance and superannuation. There is also an exemption under the DDA in relation to employment in combat duties or peacekeeping services in the Australian Defence Force or the Australian Federal Police, or when selecting a person to undertake domestic duties at the residence of an employer. In certain cases it may also be allowable for an employer to employ a person with a disability on a modified wage, based on his or her productive capacity. The DDA also permits the Australian Human Rights Commission to grant temporary exemptions from some provisions of the Act in certain circumstances. Special measures have the goal of fostering greater equality by supporting groups of people who face, or have faced, entrenched discrimination so they can have similar access to opportunities as others in the community. The DDA provides for special measures that improve equality of opportunity for people with disabilities. Employers are not required to make adjustments to their workplace if they can prove that an adjustment would be far too expensive, difficult, time consuming or cause some other hardship. This is called‘unjustifiable hardship’. Unjustifiable hardship also applies to other situations. The DDA says it may not be against the law to discriminate in the provision of access to goods, services or facilities if it can be demonstrated that making the adjustments required to accommodate the person would place an unjustifiable hardship on the organisation. For example, it may not be against the law to only provide entry to a building by a set of stairs if the owner of the building can show that it would cause unjustifiable hardship to modify the building to provide wheelchair access. In most cases the person with a disability will be able to tell the employer what reasonable adjustments are needed. If necessary, employers should also seek advice from government agencies or organisations which represent or provide services to people with disabilities. Changing recruitment and selection procedures. For example, providing a sign language interpreter for a Deaf person or ensuring the medical assessor is familiar with a person’s particular disability and how it relates to the job requirements. Modifying work premises. For example, making ramps, modifying toilets or providing flashing lights to alert people with a hearing loss. Changes to job design, work schedules or other work practices. For example, swapping some duties among staff or providing regular meal breaks for a person with diabetes. Modifying equipment. For example, lowering a workbench or providing an enlarged computer screen. Providing training or other assistance. For example, running induction programs for staff with a disability and their co-workers, providing a mentor or support person for a person with an intellectual disability, and including staff with a disability in all mainstream training. The Federal Government can provide financial assistance for workplace modifications for employees with disabilities. For more information go to http://jobaccess.gov.au/content/employment-assistance-fund. If an employee develops a disability – either through an injury in the workplace, an unrelated accident or an illness – and he or she is still able to perform the essential duties of the job, the employee should be given any assistance needed to do the job unless it would cause the employer unjustifiable hardship. If an employee has a work-related injury, there may be an overlap between work health and safety legislation and workers compensation schemes and the DDA. The employer should ensure that an employee with a work-related injury is given appropriate duties and assistance while he or she recovers from the injury. The employer will also need to determine whether the employee can still perform the essential duties of the job – with assistance or adjustments, if required – before considering dismissal. For example, Frank had been employed for many years as a driver with a large transport company. He then had a work-related injury which restricted him to lifting weights of no more than 30kg. Frank said he was able to carry out his pre-injury duties with minor adjustments but was denied the option of returning to work because of his injury. This may be disability discrimination. It is against the law to harass a person because of their disability or because he or she is a relative or associate of a person with a disability. disparaging remarks to staff who have made compensation claims. For example, Adam, who has an intellectual disability, worked in a food production company. His supervisor and co-workers harassed him constantly. They called him ‘stupid’ and ‘f****** dickhead’, pinched his arms and kicked his legs, and deflated the tyres of his pushbike and tied it up so he couldn’t use it. He eventually left the job because of the stress of the harassment. The DDA makes it unlawful to discriminate in the provision of goods and services, such as banking and insurance services; services provided by government departments; transport or telecommunication services; professional services, such as those provided by lawyers, doctors or tradespeople; and services provided by restaurants, shops or entertainment venues. because they have a disability. For example, it would be discrimination if a restaurant refused a person entry because he or she is blind and is accompanied by a guide dog. This applies to existing places as well as places under construction. To comply with the DDA, existing places may need to be modified to be accessible, except where this would involve unjustifiable hardship. This means that every area and facility open to the public should be open and available to people with a disability. They should expect to enter and make use of places used by the public if people without a disability can do so. Facilities in these places should also be accessible (wheelchair-accessible toilets, lift buttons within reach, tactile and audible lift signals for people with vision impairments). Rather than being confined to a segregated space or the worst seats, all areas within places used by the public should be accessible to people with a disability. Information available to users of the premises should be accessible. A ramp was installed at the front door of a bank to enable a local customer to independently conduct her financial transactions. A shopping complex provided way-finding information on how to get to the lifts. A lift in an office building was adapted to provide tactile and audio information about floor numbers. The DDA does not require the provision of access to be made if this will cause major difficulties or excessive costs to a person or an organisation. This is called ‘unjustifiable hardship’. discuss this directly with the person or people involved, if appropriate. If adjustments cause hardship it is up to the organisation to show that they are unjustified. Employers have a legal responsibility not to discriminate and to take all reasonable steps to prevent disability discrimination, including in the areas of recruitment; work conditions and salary; promotion; training and development; disciplinary action and termination. 'Reasonable steps' may include putting in place policies and procedures to create a discrimination-free environment. It could also include procedures to deal with allegations of discrimination and harassment made by employees or customers. Employers should make ‘workplace adjustments’ to usual processes, the workplace and workplace practices that allow employees with a disability to effectively do their work and participate in the workplace. Employers should make reasonable workplace adjustments in a timely way and in consultation with the employee with disability. It is against the law to victimise a person for making, or proposing to make, a complaint to the Australian Human Rights Commission about disability discrimination. Employers can also be held legally responsible for discrimination or harassment by their employees. For more information, see the fact sheet, Vicarious liability.